I still disagree with those pessimist economists who now occupy our media, arguing that the economy after one year has never fared better under Muhammadu Buhari administration. I strongly believe that to be a good economist, one should also be a good historian after all whatever happens today has had its own precedence. It took President Franklin D. Roosevelt from March 4, 1933 when he was sworn in as the president of the United States to August 14, 1935 to be able to turnaround America’s battered economy caused by the great depression. The same thing was what Deng Xiaoping did. Upon inheriting a completely rundown China’s economy caused by decades of blind communist experimentation as a result of wanting to create an egalitarian society, from December 17, 1978 when he took over the mantle of leadership to June 1985, with nothing meaningful happening. During the years, Deng and his close team took the time to carefully think through the problem and what needed to be done. Social capitalist system rather than continuing with the failed communist system became the answer to China’s eventual exit from poverty with double digit growth, leading to lifting up over 600 million Chinese out of poverty in less than 30 years. Even economy’s gradually taking off, did not stop endless protests to Deng’s government, including the infamous Beijing Tiananmen Square protests that between April 15, 1989 and June 4, 1989 had young students from across the country permanently occupying the square. From these, we should agree that 13 months (or even one and half years) are not enough to be able to put in place the kind of policy measures this country needs in an effort to begin to see the badly needed irreversible economic growth. Let us also not forget that this is the first time in the history of our democratic journey that an opposition party, a party formed within less than two years by numerous micro parties, could take over power from a formidably powerful party that ruled Nigeria for 16 years uninterrupted. Bearing this in mind will also mean recognizing the loads of intractable economic problems left behind by the exiting ruling PDP. Besides Buhari administration inheriting an economy at the edge of collapse, to worsen the situation, oil, the country main revenue source plunged in along with huge drop in the country’s output because of militancy in the Niger Delta. 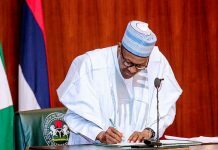 Understandably, without other sources of revenue, including tax revenue to quickly fill the huge revenue gap, President Buhari was powerlessly knocked left, right and center. The government never envisaged finding itself in this kind of hopelessness. While this is the reality this government has to contend with, the rush to see immediate tangible economic benefits by the suffering people of Nigeria is understandable, after all, they elected the president to make their lives better not worse. Of course, I would be surprised that given the current economic hardships rather than Nigerians putting pressure on Buhari they should be doing otherwise. However, while it is okay for the masses to be pressing for immediate economic fixes, I am stunned — to say the least — to see how those who should know the kind of difficulty and the amount of time needed to turnaround our economic misfortunes are the loudest in singing the song of magical solutions to our decades-long economic malaise. Because I believe in serious diagnosis of the problem, I also believe in assembling the right tools in getting the problems not only fixed but permanently fixed so as to avoid the possibility of returning to the same problems in future. Putting together a comprehensive economic road-map for this country, I will say needs a lot of time, especially if we want to begin the long overdue industrialization and economic diversification journey. And because the economic mess is really mind-boggling and more deep-seated than we can imagine, fixing the problem means as the usual fire-brigade solutions have never solved America’s or China’s problems, avoiding it remains the smartest way to once and for all solve our perennial economic problems. Yes, as real, gloomy and pessimistic as the IMF has recently painted our economic situation, like every other human situation, as hopeless as it is, there is way out. This is only a call to duty for both the government and the people of Nigeria. It only tells us that for us to come out winners in our current situation, we should look for unconventional policy approaches. I don’t agree that a country of gifted people as Nigeria shouldn’t find solution to its difficult economic problems, given that we still have the human and natural resources needed to turn Nigeria into a double-digit growing economy. That is why I still believe that if this government is given the time required and supported by all Nigerians, a phenomenal growth is not far with some homemade solutions put in place by this government. First, we should all come to the painful economic reality that the era of flood of petrodollars is over. Second, we should all accept that either we diversify the economy by industrializing it, or we should be ready to perish without having in place the kind of economic shock-absorbers seen in other modern economies that have always seen them through harsh situations like ours today. Third, we should all come to agree that our current high cost of doing business is not only unacceptable, but remains the reason why importation of finished goods that could be easily made locally should never end. That is why the present conscious but difficult efforts of this government to discourage floods of imports, including systematically imposing tariffs to deny importers not only access to official forex, but possibly also deny them access to our huge consumer market through goods confiscation should be praised and supported by all Nigerians. This way, imported goods dumpers should either relocate their factories to Nigeria or they lose access to our consumer market. While we welcome this new policy measure, we should insist that government should expand the current local content policy by insisting that henceforth 80% of the goods displayed and sold in supermarkets and other sellers should be locally sourced from indigenous producers. Our local content policy should go further to insist on all contracts paid for with taxpayers’ money should only be awarded to companies that are not only 100% owned and managed by Nigerians. No doubt, local content policy accompanied with focused economic patriotism that insists on buying made in Nigeria goods, in no distant time, the current import pressure on our scarce forex and the accompanying imported inflation would eventually disappear. 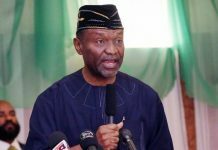 But to ensure that the recession that has been hovering around our economy never lands, like what Roosevelt did in 1930s to bring to an end America’s great depression, averting recession in Nigeria requires President Buhari injecting a minimum of N3tn annually into the country’s grassroots economy. Just like Roosevelt’s social welfare policies, Buhari’s social interventionist policies too should besides making the school feeding program a priority, monthly stipends of not less than N10,000 (instead of N5,000) given to millions of our poor families, widows, elderly, mentally and physically challenged Nigerians should be promoted with the rigor it requires. Injecting huge liquidity into the economy, besides being the secret magic wand, flooding the economy with new money undoubtedly is what is needed to kick-start economic recovery, especially when driven by grassroots-led economic growth. Should the country’s huge informal economy be made to lead the economic recovery and growth, besides reversing the current import pressures on the economy, empowering local farmers, food sellers, craftsmen, small manufacturers, small shop-owners, small transporters, etc. it will generate unprecedented trickle-down effect along with high multiplier effect with the overall result rather than being recessionary pressures is a sustainable economic boom. This economic empowerment of majority of our citizens by increasing the purchasing power of the economically excluded is the magic wand which increasing their consumer power should increase production and new jobs. In other words, if by empowering the marginalized and excluded millions of Americans by signing into law on August 14, 1935, an act that replaced laissez-faire capitalism with social welfare capitalism, America’s deep-seated economic malaise was finally resolved, why shouldn’t we adopt this method? 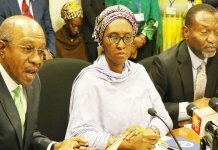 If government should boldly spend trillions of naira in increasing the purchasing power of millions of Nigeria’s poorest of the poor, rather than increasing consumption that increase imported goods, will grow demand for locally made goods and definitely encourage local producers of locally made goods to produce and sell more. And by empowering local producers and sellers, it will trigger the expansion and modernization of local production along local hiring of new hands to help them out. The good news is that unlike inflation caused by imported goods, the inflation caused by increasing liquidity that empowers grassroots economy is that the inflation it generates is, in fact, a healthy inflation which is inevitable in growing and diversifying such an emerging economy. But for all these to be achieved, we need a secure political environment. That is why the present activities of various militant groups across the country should be brought to an end, starting with doing away with the usual African politics of zero-sum game; a kind of winner takes it all politics. That is equally why as the father of the nation who is interested in leaving behind a more united nation as his legacy, President Buhari should as a matter of urgency, reach out to all ethnic groups so that all will begin to feel a sense of belonging in his government. Making his a government of national unity will mean that no section of the country feels excluded to the extent of going about sabotaging the government. It is human nature that if one is not made part of something he holds dearly, to punish those who excluded him, there’s a tendency for him to go as far as ambushing, undermining and sabotaging the efforts of those who excluded him with the ultimate goal of inflicting enough damage on their activities so that at the end of the day, they would regret having excluded him in the first place. That is why to see this country thrive on unity, justice, equity, and fairness, the long-term solution remains fiscal federalism, which as toxic as it could sound to those who do not see the ticking economic time-bomb, it is the only way to achieve a united country and the much needed economic growth, bring a stop to the incessant militancy and insurgency. Mr President using military option rather than defeat the current militancy in the Niger Delta will in fact aggravate it. Why military option can never be the kind of solution to pursue in the Niger Delta is because dropping a bomb in the Niger Delta, especially if civilians were among the casualties, could trigger an unprecedented recourse to ferocious guerrilla warfare, including exposing soft targets across the country to terrorist attacks. This will make Boko Haram a child’s play. This government should never be tempted to play into the hands of the militants because some potential beneficiaries of such a war are asking for it. Besides making militants harvest enormous public sympathies, military fighting in the Niger Delta could seriously fracture the country’s fragile unity to the extent that recovering from that would be extremely difficult.